Here is how to make traditional Christmas Cake (Norwegian Julekake), also called yule bread. As part of getting ready for Christmas, many moms around Norway bake several loaves of this delicious yule bread or julebrød, as we Norskes call it. You might wonder, how do we serve his bread? Do we toast slices of Julebrød and spread butter on it? Yes that is good; you can also make up a bunch of delicious sandwiches with your favorite sandwich meats or spreads. Mom always made syltaflesk and fårerull and that is the ultimate sandwich - open face, of course. I enjoy Christmas cake with butter and thin slices of Norwegian Goat Cheese or brunost as we usually call it. 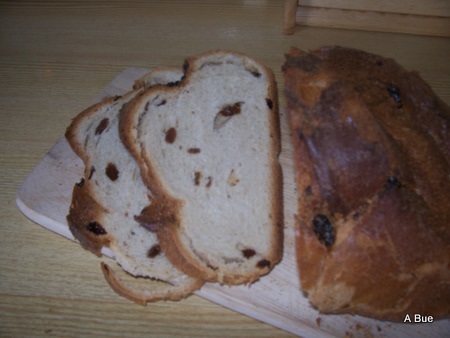 This recipe for Yule Bread/Julekake makes 3 round loaves. Mix 1/3-cup flour with all dry ingredients. Add 1/2-cup flour to milk. Beat 2 minutes medium speed. Add 1/2-cup flour and eggs and mix. This is a baking tip: Regarding yeast baking, the amount of flour to use is approximate. It is better use less flour than the recipes calls for and then add flour as needed in order to be able to remove the dough from the bowl easily without it being too hard or too firm. It is easier to adjust loose yeast dough by adding flour than vice versa. Remove from baking pans and cool completely before placing into plastic bags. This Christmas cake/Julebrød can be frozen. Hope you will enjoy our wonderful Norwegian Christmas tradition.